Objective: To define the factors related to ALS outcome in a population-based, prospective survey. Methods: The 221 patients (120 men and 101 women) listed in the Piemonte and Valle d’Aosta ALS Register between 1995 and 1996 were enrolled in the study. The patients were prospectively monitored with a standard evaluation form after diagnosis. Results: Mean age at onset was 62.8 (SD = 11.2) years. According to El Escorial diagnostic criteria (EEDC), 112 patients had definite ALS, 85 probable ALS, 18 possible ALS, and six suspected ALS. The median survival time from symptom onset was 915 days (95% CI = 790 to 1065). The median survival time from diagnosis was 580 days (95% CI = 490 to 670). In univariate analysis, outcome was significantly related to age, onset site, EEDC classification, and symptom progression rate (i.e., the rate of decline of muscle strength and bulbar and respiratory function in the 6 months after diagnosis). In the Cox multivariate model, age, progression rate of respiratory, bulbar, and lower limb symptoms, EEDC classification, percutaneous endoscopic gastrostomy, and treatment with riluzole were significantly related to outcome. Conclusions: The rate of progression of symptoms in early ALS is predictive of disease outcome. We evaluated the factors related to outcome in a large population-based series of cases listed in the Piemonte and Valle d’Aosta ALS Registry10 during the 2-year period 1995 and 1996 and prospectively monitored. Study area and case finding. The study was performed in Piemonte and Valle d’Aosta, Northwestern Italy (total area = 28,662 km2). The population numbered 4,418,503 at the last census of 1991. The primary sources of cases were the 26 neurologic departments of the two regions. There are two ALS referral centers in the area, one at the Rehabilitation Institute in Veruno, and the other at the Neuroscience Department, University of Turin. The secondary sources were rehabilitation and geriatrics departments, and the Piemonte Central Regional Archive, a database that contains all discharges from public and private hospitals of the Piemonte Region, codified according to the 9th Revision of International Classification of Diseases. Patients with discharge code 335.2 were enrolled in the study. The clinical records of cases from secondary sources were reviewed to verify that the patient met the eligibility criteria. If the patient was alive, he or she was contacted by telephone and visited by a neurologist participating in the study. ALS was diagnosed according to EEDC.8 Patients with any form of motor neuron disease were enrolled in the study, but only subjects with a diagnosis of definite or probable ALS at any time during the course of the disease were included in the survival evaluation. Doubtful diagnoses were discussed in periodic meetings of the investigating group. Diagnosis was verified at each follow-up visit. No patient enrolled in the study cohort had received experimental drugs. Investigators used a standard questionnaire to collect patients’ demographic information, clinical history, EEDC classification, neurologic and laboratory findings, and treatment details. Riluzole became available in Italy in January 1996 and was given free of charge by the National Health System from November 1996. The duration of riluzole therapy, doses, adverse effects, and reasons for discontinuation were recorded. During regular follow-up visits (at least every 6 months), clinical information was collected on a standard form. At entry and at each follow-up visit, patients underwent the manual muscle test, which was administered by the same examiner using the Medical Research Council (MRC) scale (6 points; range = 0 to 5). The test evaluates eight muscle groups in the upper limbs (shoulder abductors; elbow, wrist, and finger flexors and extensors; thumb opposition) (range = 0 to 80) and seven muscle groups in the lower limbs (hip flexors; knee, ankle, and toe flexors and extensors) (range = 0 to 70). Neck flexors and extensors were also evaluated (range = 0 to 10). In addition, patients were evaluated with the Norris ALS disability scale.11 Bulbar involvement was evaluated with a modified version of the bulbar section of the Appel Rating Scale12; speech was quantified on a scale from 3 (normal) to 0 (markedly impaired) and swallowing from 4 (normal) to 0 (markedly impaired). Percent-predicted forced vital capacity (FVC%) was examined at entry and at least every 6 months thereafter. During follow-up, major interventions such as percutaneous endoscopic gastrostomy (PEG), noninvasive ventilation (NIV), and tracheostomy were recorded. The cause of death was also recorded. To define the symptom progression rate, we evaluated the rate of decline of each variable in the 6 months after diagnosis as follows: ([baseline evaluation − 6th month evaluation]/time in months). The following variables were examined: upper limb MRC, lower limb MRC, neck MRC, bulbar score, FVC%, and Norris Scale score. For the purpose of this study, follow-up ended on October 31, 2000. No patients were lost to follow-up. We used the manual muscle test to determine muscle strength because instrumentation for quantitative myometry was available in only a few centers in our region. This test and the MRC scale, which provides a reliable semiquantitative estimate of muscle strength, have been used in several ALS clinical trials.5,13⇓ We also applied the Norris ALS disability scale, which was the most widely used disability measure for ALS when the study was designed. Survival curves were calculated with the Kaplan-Meier method and compared with the log-rank test.14 Patients who underwent assisted ventilation via tracheostomy were considered deceased on the date of ventilation. For numerically continuous variables, the cut-off point that best subdivided patients into distinct survival groups was identified.15 The Cox stepwise proportional hazard model was used for multivariate analysis.16 The hazard ratio was calculated for each variable. Riluzole therapy, PEG, and NIV were included in multivariate analysis as time-dependent variables.14 A p value of <0.05 was considered significant. The SAS statistical package (SAS Institute, Cary, NC), version 6.12, was used for all analyses.17 Survival curves were calculated with day zero as the date of symptom onset. ALS was diagnosed in 230 individuals in Piemonte and Valle d’Aosta during the study. Nine were excluded during follow-up because they proved to have ALS-like syndromes or ALS variants.10 Of the remaining 221 patients, 193 were reported by the collaborating centers, and 28 came from secondary sources (22 from the Central Regional Archive and six from nonneurologic departments). Mean age at onset was 62.8 years (SD = 11.2 years). Symptoms started in the lower limbs in 87 cases (39.4%), in the upper limbs in 64 (29.0%), in the bulbar region in 69 (31.2%), and in respiratory muscles in one (0.4%). In 42 (41.6%) of the 101 women, the bulbar muscles were the first to be affected vs 27 (22.5%) of the 120 men (p = 0.005). Bulbar onset was more frequent among subjects > 69 (< 70, 32 cases, 25.0%; ≥ 70, 37 cases, 46.5%, p = 0.001). The mean age at ALS diagnosis was 63.7 years (SD = 11.2). At diagnosis, 130 (58.8%) patients had bulbar signs or symptoms, and 50 had respiratory involvement (22.6%). A total of 112 patients had definite ALS, 85 had probable ALS, 18 had possible ALS, and six had suspected ALS. The mean interval between symptom onset and ALS diagnosis was 11.1 months (SD = 9.5 months); it was slightly shorter in cases of bulbar onset (8.6; SD = 6.9) compared with onset in the upper (10.3; SD = 8.0) or lower limbs (13.5; SD = 11.9) (p = NS). It was also shorter in patients < 50 years of age (9.5 months; SD = 7.8) than patients in the 50- to 69-year group (11.1; SD = 10.2) or older (12.1; SD = 10.1) (p = NS). There were no significant differences in EEDC category at diagnosis: definite, 11.3 (SD = 11.3), probable 10.7 (SD = 13.2), possible 10.2 (SD = 8.6), and suspected 11.7 (SD = 9.9). During follow-up, 52 patients (23.5%) underwent PEG, 23 (10.4%) NIV, and 14 (6.3%) tracheostomy. Riluzole (50 mg twice daily) was given to 119 patients. Five patients stopped therapy after a mean of 3 weeks because of nausea. The other 114 patients took riluzole regularly throughout the course of the disease. The 28 cases identified through secondary sources were excluded from the survival study, because they were not followed up from diagnosis by one of the neurologists participating in the study. However, the main demographic and clinical factors, as well as the survival rates, of these cases did not differ significantly from those of patients included in the evaluation (additional material related to this article can be found on the Neurology Web site. Go to www.neurology.org and scroll down the Table of Contents for the July 9 issue to find the link for this article.). The median survival time from symptom onset was 915 days (95% CI = 790 to 1065). The 3- and 5-year survival rates were 40.5% (SE = 3.5%) and 24.7% (SE = 3.1%). The median survival time from diagnosis was 580 days (95% CI = 490 to 670 days); the 3-year survival rate was 28.8% (SE = 3.2%) and the 5-year survival rate was 20.2% (SE = 3.1%). The median survival time and 3-year survival rate for each variable evaluated are reported in the supplementary data (go to www.neurology.org and scroll down the Table of Contents for the July 9 issue to find the link for this article.). Besides age and site of onset, outcome was significantly related to the symptom progression rate in the upper and lower limbs, in bulbar, and in respiratory muscles and to the involvement of bulbar and respiratory muscles at diagnosis. Definite ALS at diagnosis was also significantly related to outcome (figure). Figure. Survival curves according to El Escorial Diagnostic Criteria at diagnosis. Cases with definite ALS are different from the other three categories (p < 0.0001). Thick solid line = definite ALS; dotted line = probable ALS; dashed line = possible ALS; thin solid line = suspected ALS. The variables significant in univariate analysis, together with PEG, NIV, and riluzole therapy, were included in multivariate analysis. The Cox model selected progression rate of respiratory, bulbar, and lower limb symptoms, age, PEG, definite vs other EEDC categories, and riluzole therapy (table). Age is probably the most consistent factor related to outcome.1-3,13,18,19,21⇓⇓⇓⇓⇓⇓ Interestingly, all the six patients in our series with an onset age < 40 years were alive at the end of follow-up. The faster progression of ALS in older patients has been related to the motor neuron loss that often accompanies age,18,19⇓ the less intensive symptomatic care received by older individuals,19 and their greater psychological distress, which is related to a poorer prognosis.22 Most studies concur that bulbar-onset cases have a worse prognosis.1-3,10,19⇓⇓⇓⇓ However, according to some authors,22,23⇓ because patients with bulbar-onset disease are significantly older than those with spinal onset, the negative prognostic effect of bulbar onset is entirely covered by the older onset age of disease in these patients. Conversely, we found that age and bulbar involvement were independently related to survival, which indicates that the faster progression in bulbar cases is not entirely due to older age at onset. The percents of cases in our series with definite (51%) and probable ALS (38%) at diagnosis are apparently greater compared with the Irish series (57%)3; however, the later figure included cases of possible or suspected ALS at the end of follow-up, i.e., 14% of the total cohort. The difference could also be due to the shorter interval between symptom onset and diagnosis (8 vs 11 months in our survey). We found that definite ALS at presentation was significantly related to outcome and resulted in a median survival of 23 months, compared with 34 months for probable ALS, 35 months for possible ALS, and 58 months for suspected cases. Because this finding is not due to a different onset-to-diagnosis interval in the four diagnostic groups, it can be inferred that EEDC status at diagnosis is directly related to ALS progression rate. The only other prospective study to analyze survival according to EEDC category3 found no significant difference despite a median survival time in each category similar to ours. When the revised EEDC were applied retrospectively, only three patients moved from the clinically possible to the clinically probable–laboratory supported category, and this did not substantially alter survival of the diagnostic groups. Our study indicates that the early course of ALS is a reliable indicator of the ensuing course of the disease. Early predictions of ALS outcome will have an impact on counseling of patients and their families and will help them plan their future. Finally, this survey suggests that guidelines for the use of PEG and probably also of NIV should be applied in trial protocols and that both procedures should be included in data analysis because they have a major effect on the final outcome of patients with ALS. Piemonte and Valle d’Aosta Register for ALS (PARALS): Coordinating center: 2nd Division of Neurology, Department of Neuroscience, University of Torino, Italy. Project coordinator: A. Chiò, MD. Study monitors: A. Calvo, MD, N. Di Vito, MD, M. Vercellino, MD. Scientific Committee: A. Bertolotto, MD, E. Bottacchi, MD, A. Chiò, MD, D. Cocito, MD, M.T. Giordana, MD, M. Leone, MD, L. Mazzini, MD, G. Mora, MD. Collaborating centers: A. Chiò, MD, A.A. Terreni, MD, D. Schiffer, MD, R. Mutani, MD, D. Cocito, MD, B. Bergamasco, MD, I. Rainero, MD (Department of Neuroscience, Section of Neurology, University of Torino, and Azienda Ospedaliera San Giovanni Battista, Torino), A. Bertolotto, MD, A. Tribolo, MD, R. Sciolla, MD, F. Mondino, MD, M.T. Giordana, MD (Department of Neuroscience, Section of Neurology, University of Torino, and Azienda Ospedaliera San Luigi Gonzaga, Orbassano), M. Leone, MD, P. Gaviani, MD, F. Monaco, MD (Department of Neurology, “Amedeo Avogadro” University, Novara), M. De Mattei, MD, E. Morgando, MD (Department of Neurology, Azienda Ospedaliera San Giovanni, Torino), L. Sosso, MD, M. Gionco, MD (Department of Neurology, Ospedale Mauriziano, Torino), U. Morino, MD, M. Nobili, MD (Department of Neurology, Ospedale Martini, Torino), L. Appendino, MD (Department of Neurology, Ospedale Maria Vittoria, Torino), L. Mazzini, MD, D. Piazza, MD (Department of Neurology, Ospedale S. Giovanni Bosco, Torino), E. Oddenino, MD, W. Liboni, MD (Department of Neurology, Ospedale Gradenigo, Torino), G. Vaula, MD, G. Ferrari, MD (Department of Neurology, Ivrea), M. Favero, MD, C. Doriguzzi Bozzo, MD (Department of Neurology, Pinerolo), P. Santamaria, MD (Department of Neurology, Vercelli), U. Massazza, MD, E. Bollani, MD (Department of Neurology, Biella), A. Villani, MD, R. Conti, MD (Department of Neurology, Domodossola), G. Mora, MD, C. Balzarini, MD (Department of Neurological Rehabilitation, Fondazione S. Maugeri, Clinica del Lavoro e della Riabilitazione, IRCCS, Scientific Institute of Veruno), M. Palermo, MD (Department of Neurology, Alessandria), F. Vergnano, MD (Department of Neurology, Casale Monferrato), S. Cordera, MD, C. Buffa, MD (Department of Neurology, Novi Ligure), M.T. Penza, MD (Department of Neurology, Tortona), F. Fassio, MD (Department of Neurology, Asti), P. Meineri, MD (Department of Neurology, Azienda Ospedaliera Santa Croce e Carle, Cuneo), A. Cognazzo, MD, C. Mocellini, MD, A. Dutto, MD, A. Cucatto, MD (Department of Neurology, Savigliano), C. Cavestro, MD, W. Troni, MD (Department of Neurology, Alba), G. Corso, MD, E. Bottacchi, MD (Department of Neurology, Aosta). The authors thank Jean Ann Gilder for editing the text. Additional material related to this article can be found on the Neurology Web site. Go to www.neurology.org and scroll down the Table of Contents for the July 9 issue to find the link for this article. *See the Appendix on page 102 for listing of the Piemonte and Valle d’Aosta Register for ALS (PARALS) participants. Lee JR, Annegers JF, Appel SH. Prognosis of amyotrophic lateral sclerosis and the effect of referral selection. J Neurol Sci . 1995; 132: 207–215. Preux PM, Couratier PH, Boutros-Toni F, et al. Survival prediction in sporadic amyotrophic lateral sclerosis: age and clinical form at onset are independent risk factors. Neuroepidemiology . 1996; 15: 153–160. Traynor BJ, Codd BM, Corr B, Forde C, Frost E, Hardiman OM. Clinical features of amyotrophic lateral sclerosis according to the El Escorial and Airlie House Diagnostic Criteria. Arch Neurol . 2000; 57: 1171–1176. Albert SM, Murphy PL, Del Bene ML, Rowland LP. A prospective study of preferences and actual treatment choices in ALS. Neurology . 1999; 53: 278–283. Miller RG, Munsat TL, Swash M, Brooks BR, for the World Federation of Neurology Committee on Research. Consensus guidelines for the design and implementation of clinical trials in ALS. J Neurol Sci 1999;169:2–12. Chiò A, Finocchiaro E, Meineri P, Bottacchi E, Schiffer D, and the ALS Percutaneous Endoscopic Gastrostomy Study Group. Safety and factors related to survival after percutaneous endoscopic gastrostomy in ALS. Neurology 1999;53:1123–1125. Aboussouan LS, Khan SU, Meeker DP, Stelmach K, Mitsumoto H. Effect of noninvasive positive-pressure ventilation on survival in amyotrophic lateral sclerosis. Ann Intern Med . 1997; 127: 450–453. World Federation of Neurology Subcommittee on Motor Neuron Disease. El Escorial World Federation of Neurology criteria for the diagnosis of amyotrophic lateral sclerosis. J Neurol Sci . 1994; 124 (suppl): 98–107. Chancellor AM, Slattery JM, Frazer H, Swingler RJ, Holloway SM, Wallow CP. The prognosis of adult-onset motor neuron disease: a prospective study based on the Scottish Motor Neuron Disease Register. J Neurol . 1993; 240: 339–346. Piemonte and Valle d’Aosta Register for ALS (PARALS). Incidence of ALS in Italy: evidence for a uniform frequency in Western countries. Neurology . 2001; 56: 239–244. Norris FH Jr, Calanchini PR, Fallat RJ, Panchari S, Jewett B. The administration of guanidine in amyotrophic lateral sclerosis. Neurology . 1974; 24: 721–728. Appel V, Stewart SS, Smith G, Appel SH. A rating scale for amyotrophic lateral sclerosis: description and preliminary experience. Ann Neurol . 1987; 22: 328–333. Christensen PB, Hoier-Pedersen E, Jensen BN. 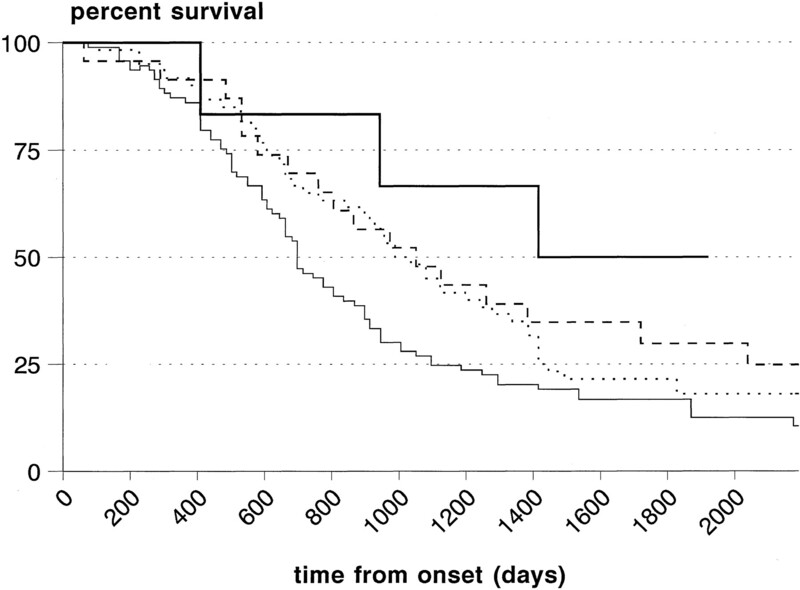 Survival of patients with amyotrophic lateral sclerosis in 2 Danish counties. Neurology . 1990; 40: 600–604. Parmar KB, Machin D. Survival analysis: a practical approach. Chichester, UK: John Wiley & Sons, 1995. Segal MR. Regression trends for censored data. Biometrics . 1988; 44: 35–47. Cox DR. Regression models and life tables. J R Stat Soc (B) . 1972; 34: 187–220. SAS. Changes and enhancement for release 6.12. Cary, NC: SAS Institute, 1996. Norris F, Shepherd R, Denys E, et al. Onset, natural history and outcome in idiopathic adult motor neuron disease. J Neurol Sci . 1993; 118: 48–55. Louwerse ES, Visser CE, Bossuyt PMM, Weverling GJ, and the Netherlands ALS Consortium. Amyotrophic lateral sclerosis: mortality risk during the course of the disease and prognostic factors. J Neurol Sci 1997;152(suppl 1):S10–S17. Armon C. Motor neuron disease. In Gorelick PB Alter M, eds. Handbook of neuroepidemiology. New York: Marcel Dekker, 1994: 407–454. Eisen A, Schulzer M, MacNeil M, Pant B, Mak E. Duration of amyotrophic lateral sclerosis is age dependent. Muscle Nerve . 1993; 16: 27–32. McDonald E, Wiedenfeld SA, Hillel A, Carpenter CL, Walter RA. Survival in amyotrophic lateral sclerosis: the role of psychological factors. Arch Neurol . 1994; 51: 17–23. McComas AJ, Upton AR, Sica RE. Motoneurone disease and ageing. Lancet . 1973; 2: 1477–1480. Borasio GD, Robberecht W, Leigh PN, et al. A placebo-controlled trial of insulin-like growth factor-I in amyotrophic lateral sclerosis. European ALS/IGF-I Study Group. Neurology . 1998; 51: 583–586. Lacomblez L, Bensimon G, Leigh PN, Guillet P, Meininger V. Dose-ranging study of riluzole in amyotrophic lateral sclerosis: Amyotrophic Lateral Sclerosis/Riluzole Study Group II. Lancet . 1996; 347: 1425–1431.